Prove yourself as a powerful guardian by completing Ana’s Bastet Challenge! We’re bringing the fierce protector from the new Overwatch short story, “Bastet,” into the game with story-inspired content available to unlock for a limited time. From now until January 22, players will be able to undertake a special trial to earn five sprays, a player icon, a victory pose, and an epic Bastet Ana skin, for a total of eight new rewards. We’re bringing the excitement of the action-packed short story “Bastet” into Overwatch by making some of the special content in the short available to unlock in-game. 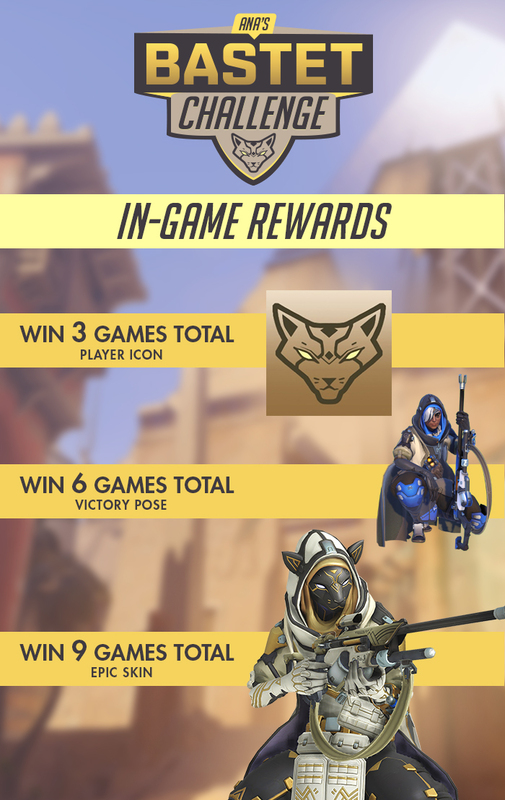 Wins in Quick Play, Competitive Play, or Arcade will all earn you a limited-time player icon, victory pose, and a new epic skin: BASTET ANA! These special Ana’s Bastet Challenge rewards are a bonus on top of your normal earnings for playing in the Arcade. While fulfilling the protector’s legacy in-game, you can watch Twitch streamers between matches to unlock even more Bastet-themed cosmetics. Tune in to participating broadcasters while they’re playing Overwatch anytime through January 22 to earn five Ana's Bastet Challenge sprays! 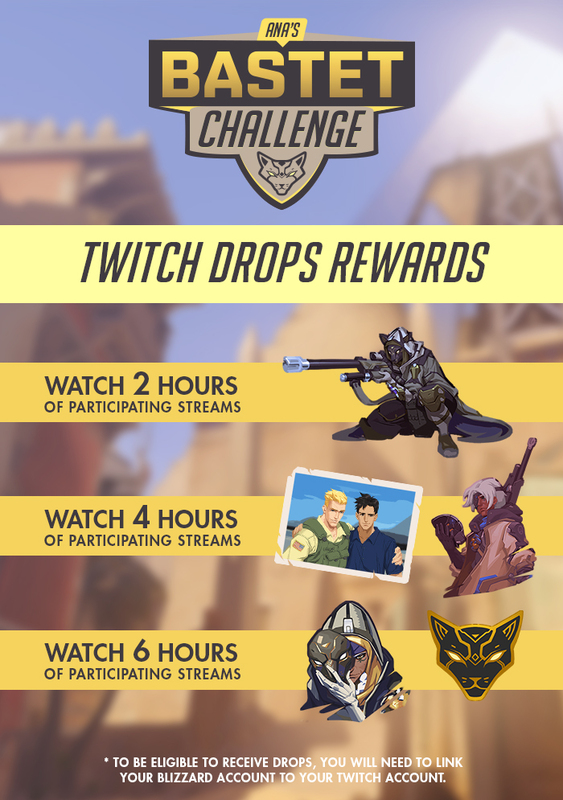 Ana’s Bastet Challenge Twitch Drops will be available January 8 – 21 on select Twitch broadcaster channels—view the full list of participating channels below. Tune in during the highlighted dates and times to support a specific broadcaster, or watch their streams at any point during the campaign to unlock these rewards. For more information on Twitch Drops, click here. For more information on Twitch Drops, watch the video below! Relive Ana's transformation into a fierce protector with “Bastet,” a new short story by Michael Chu, taking place after the events of the “Old Soldiers” comic. Power up your allies in-game and keep your eye on the aforementioned broadcaster channels so you can add all of these limited-time cosmetics to your collection. Now get in there—this mission ends January 21!